Former Aston Martin design boss Henrik Fisker has revealed his ‘Thunderbolt’ design study at the Amelia Island Concours d’Elegance in Florida. 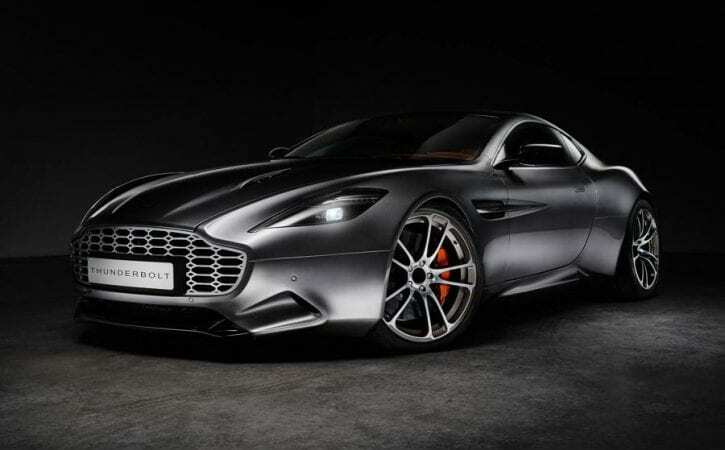 The concept, which is based on the Aston Martin Vanquish, features new carbonfibre bodywork and a much larger interpretation of the Aston Martin grille. At the rear, the Thunderbolt has redesigned pillars and a steeply raked rear screen, alongside new light clusters and a boot-mounted spoiler. Fisker has lowered the Thunderbolt by 15mm compared to the standard Vanquish, and the model sits on 21in alloy wheels shod with performance tyres. While Fisker makes no mention of any mechanical upgrades, it’s likely that the Thunderbolt keeps the Vanquish’s 6.0-litre naturally aspirated V12 engine, which produces 568bhp and 465lb ft – enough to propel the standard Vanquish to 62mph in 3.8sec and give it a top speed of 201mph. Inside, the car focuses on connectivity and features a world-first application of a curved infotainment screen. The 11.6in unit, which has been designed by Panasonic, is height adjustable. The Thunderbolt also features a bespoke wine bottle holder by the rear seats. Although Fisker has stressed that the Thunderbolt has no formal association with Aston Martin and exists as a design study only, an “extremely limited number” of models could be built if the car is received well during its first public outing. Any Thunderbolts built would not feature the curved infotainment screen and would get minor styling adjustments. In addition to the Thunderbolt, Fisker is also showcasing the production version of his Ford Mustang-based Rocket concept. Created in conjunction with LA-based Galpin Motors, the world’s largest Ford dealer, the concept was first seen at the LA motor show last year.